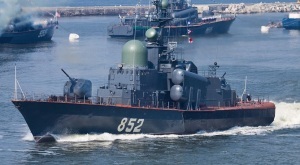 R-129 Kuznetsk (hull number 852) is a Project 12411T missile boat designed for destruction of enemy warships, transport vessels, and amphibious means; air defense reinforcement of task units and single ships, coverage from attacks of enemy light forces. The boat was laid down at Srednenevsky Shipyard on February 3, 1983 under serial number of 204. Put afloat on November 19, 1984. Commissioned on December 28, 1985. The boat received the name Kuznetsk in January 2013.